Elementary school teachers and naturalists preach that insects are our friends, but we still have a largely insect-phobic culture. When Mom screeches upon seeing a bee, when Uncle Joe kills every insect he sees and when the horror movie features giant spiders, little Johnnie learns fear. make honey, and they all help by pollinating our flowers and food crops. And some of them are like little soldiers that fight off other insects that damage our plants. But it’s a hard sell. Stand still in the garden some sunny day, and you will have a glimpse into a noisy, complex community. Many kinds of insects –butterflies, wasps, flies, lacewings, beetles –are eating nectar or pollen, and others –honeybees, bumblebees, wasps –are gathering pollen to take back to their hives or nests. 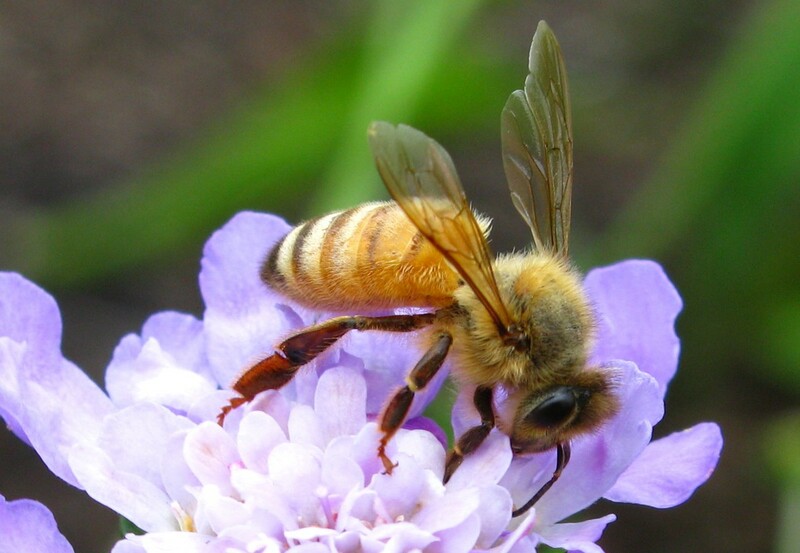 All the flower visitors are pollinators, as they transfer pollen on their legs and bodies from one flower to another. Many insects in the garden also are hunters. They lurk around or inside flowers, waiting to pounce on some of those busy pollinators. Little spiders or beetles might be among those hunters, but they also have another role – they’re food for birds. Some insects (parasitoid wasps) are there to lay their eggs on other insects. They plant their eggs on caterpillars, or on other insects’ eggs or bodies. Still others (hover flies) are acting like guys hanging around a singles bar; they’re watching for girls having dinner, and they’re planning to hit on a cute one when she’s leaving. Some even get into fights and chase other fellows away so their turf is wide open. One patch of flowers has a hundred different dramas happening, so imagine the life of a whole garden. Birds need insects. There is a direct correlation between the insect biomass — the quantity of insects available to eat—and the bird population. If you have more insects and diverse kinds of insects, you’ll have more birds. The question then becomes: What should you plant to attract the best insects to please the most desirable birds? The simplest answer has two parts: Maintain a diverse yard and garden, with many species of flowering plants, and include as many native plants as possible. For the pollinators, the hands-down winner in my garden, with the highest count of diverse species, is Veronicastrum (Culver’s root), a stately native plant with white or pale pink, apparently irresistible spires. My Jack goes straight to this plant with his camera, to capture the action. Use this handsome plant. Still, the pollen and nectar-rich plants that attract butterflies and other pollinators are not enough. Without abundant natural habitat, native insects — the ones that feed our birds, those upon whom the entire web of life depends — don’t have enough plants for breeding purposes. Butterfly caterpillars and other native insects must have specific plants to eat, and for laying their eggs. If those plants are missing, all the pollen in the world won’t matter, since no new butterflies will be born. Perennials: All the Asclepias (milkweed) species, coneflowers, black-eyed Susans and other Rudbeckia species; Vernonia (New York ironweed), Eupatorium (Joe-Pye weeds), bee balm, liatris, goldenrod, native asters and Veronicastrum. Shrubs, vines and trees: Cephalanthus (buttonbush), Lindera benzoin (spicebush), Virginia creeper, Amelanchier, Aronia, Clethra, sweet bay magnolia, tulip trees, oaks, sweet gum, and many native hollies, dogwoods and viburnums. But what if you see lots of insects on some favorite nonnative plants? Don’t take false comfort. Insects will land wherever they may, but studies show that nonnative plants offer little benefit. Your English ivy hosts or feeds nothing valuable, but Virginia creeper feeds the gorgeous Pandora sphinx. Nonnative Buddleia gives nectar to a riot of butterflies, but can’t feed any caterpillars, whereas Asclepias species do it all. To offer the best habitat, yards need more than flower gardens. Include trees, shrubs and ground covers, in the form of hedgerows or islands. Provide water at various levels; even tiny insects need water before they can go off to hunt or gather pollen. Reduce your lawn area; turf grass is the least valuable planting. And obviously, there’s no place for pesticides; most do far more damage than you know. To learn more, I recommend Douglas Tallamy’s “Bringing Nature Home” (Timber Press, 2007). This entry was posted in Pollinators. Bookmark the permalink. Post a comment or leave a trackback: Trackback URL.